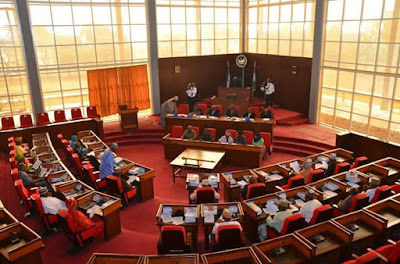 Home / Corruption / Opinion / OPINION: WHAT HAS KWARA HOUSE OF ASSEMBLY DONE AGAINST CORRUPTION IN THE STATE? OPINION: WHAT HAS KWARA HOUSE OF ASSEMBLY DONE AGAINST CORRUPTION IN THE STATE? The Kwara state House of Assembly, like any other legislative assembly in a democratic setting is ideally meant to be a check on the executive arm of government in a federal system like that of our country, Nigeria, at the state level. They're meant to be the eyes and voice of the people, who'll see everything done by the government and raise their voices for or against such things done, with the people first on their mind and they must see all plans, policies and actions of the government working for the people. Before i proceed to my subject of this write-up, it should be noted that the success or otherwise of a government, either at the federal or state level is a function of the collective efforts of all the arms of such government's and every worthy leader must learn to take responsibility and be accountable for the success or failure of a government under which he/she is serving. It is upon this background that I found the reaction of the Honorable Speaker, Kwara State House of Assembly, Rt. Hon. Dr. Ali Ahmad to President Muhammadu Buhari anti corruption war immoral, prejudicial, subjective and to a large extent, self-serving. This is owing to the fact that Hon. Ali Ahmad is a frontliner in the camp of the number three citizen of Nigeria, Senate President Bukola Saraki, who is a major factor in President Buhari's government and the camp also produces the current image maker of the ruling All Progressive Congress (APC). Thoughts thus begin to agitate my mind after seeing the Kwara Assembly Speaker's comment against President Buhari-led government, of which legislative arm is led by Sen. Bukola Saraki, but singled out the President as the failure in the fight against corruption. For objectivity sake, if Dr. Ali Ahmad wants us to believe Buhari-led government is a failure in whatever sphere, it is a collective failure of the three aems of government, implying that Buhari, Saraki and the judiciary failed Nigerians on Anti-Corruption war, which was a major factor responsible for the APC winning in the 2015 general elections. The main subject of my analogy is to query what Kwara House of Assembly, led by Dr. Ali Ahmad has done against corruption in Kwara state, that convinced the Hon. Speaker of the moral right he has to condemn President Muhammadu Buhari's Anti-Corruption war. It should be noted that I'm not a Buharist, in fact, i never voted for him in 2015 general elections, but as a researcher, i believe in drawing inference from particular to generalizing. Kwara is a part of Nigeria and if CHANGE began with Kwara and other states followed suit, Nigeria will change. It would be however morally deficient, if a state that doesn't even take corruption serious as Kwara begin to condemn Federal Government's efforts against corruption, even though not holistic and objective. The 8th Assembly of Kwara state is lately one of it's kind, in term of being reactive to issues of public concerns rather than being proactive. A legislative assembly should not expect protest, public outcry over issues or a negative externalities before taking up issues. Albeit, should their sudden reactions been the legislative culture in Kwara, with objectivity, we might have been better off, but we ave been accustomed to political climate and timing being the influencer of the actions of our politicians. I will cite the following cases of corruption in Kwara state to buttress my assertion of the Kwara State House of Assembly being political reactors to issues of public concern. In this case, corruption. One of the prominent corruption haven in Kwara state is the education sector, more particularly, the State Universal Basic Education Board (SUBEB). A case of monumental fraud was discovered during this administration, where Kwarans commonwealth have been lost to leakages, resulting from payment to ghost workers. Till date, Kwarans do not know the culprits, whether they were sanctioned at all or not. Despite the fact that our rural schools have deficit of human resources and the ones available are not even getting regular payments of their salaries as at when such heinous act was exposed. Our Kwara legislator overlooked, instead of oversight! Still on education sector, on good authority, I have it that Kwara state government did not recruit teachers for more than five (5) years now, yet, teachers retire every six months, probably on grounds of age or haven spent the maximum number of year permissible in service. This is expected to reflect on the allocation meant for paying teachers monthly salaries, there should be surplus as a result of the initially active teachers, whom are migrating to pensioners. We've not seen the House Committee on education telling us about this, if they know, we also need to know. Do we talk about the Kwaran students scholarships? On annual basis, there are allocations for a meager scholarship allowance of five thousand naira (#5000) per students, excluding state and bilateral scholarship programmes. In the last ten (10) years, there was never a time Kwara state government disburse scholarship allowances to up to 50% of Kwaran students schooling across Nigeria. Some years were even skipped, no students recieved a dine and nobody is demanding for accountability. Which corruption is monumental than that? We have countless number of poorly executed public projects in Kwara state, especially road constructions. Part of the oversight functions of the legislative assembly is to ensure the citizens gets value for their taxes and this can only be achieved through oversight. We've bridge collapse at Alagbado, where the state government claimed it has mobilized contractors to reconstruct it, but the contractor never resumed on site. All we saw was the Kwara House of Assembly urging them to go do the work. Are they doing it for free or is there something we need to know that we don't? Why not direct the allegedly mobilized contractor or take actions against the delay in the interest of the people? More disturbing is the case of Harmony Holdings Limited, a company allegedly owned by Kwara state government, but the Kwara state House of Assembly was ignorant of it's dealings and properties under it. Not until the public cried out over the cloudy ownership and operation of the company. It took a very long time and pressure for our state representatives to report back to the people about Harmony Holdings. The report, just like the Speaker's statement was also subjectively and not in any way decisive or concise. Part of the term of engagement given to the committee was to note and investigate all Kwara state properties being managed by Harmony Holdings, but our House of Assembly was only able to present a report about one wanting executive of the company, yet, with indecisive stance. It was so ridiculous that to give the content of their paperwork a facelift, the Kwara State House of Assembly even demanded a physically unexisting hotel, Patigi Regatta. All other properties acquired and managed by their cronies from/under Harmony Holdings were left under cover. What more selective treatment can be worse than that of Dr. Ali Ahmed led Kwara legislative assembly? Hon. Dr. Ali Ahmad's led assembly of Kwara state have done nothing to equip her with such moral right to criticize President Buhari. He may critize Lai Mohammed to please his boss, Senator Bukola Saraki, whose name is most likely to appear in the next looters list to be released. He would have done better if he summon the courage to tell his boss to be altruistic, prioritize common goal over personal ambitions and learn to take responsibility for their collective failures. Hhhmmm. How do we speak out wen we dont hv the education on how government is run. We are mostly illitrates on this issue and I love this site. Pls continue educating us. How do we also air our views so that they hear what we are saying?